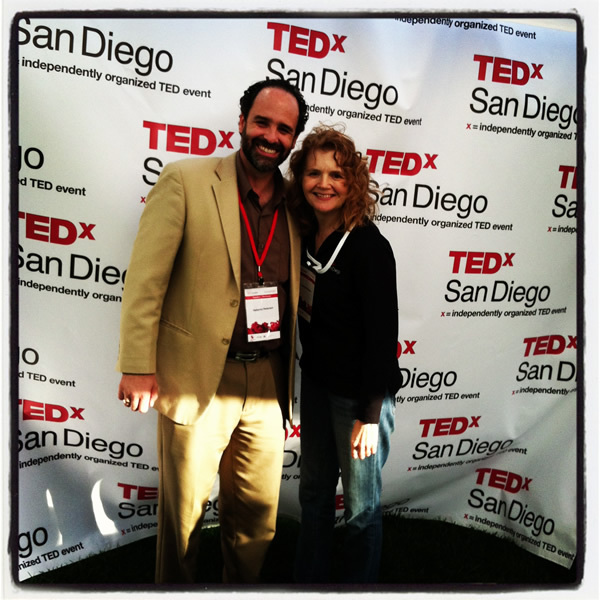 For the second year in a row I had the pleasure of being part of the team that designed TEDxSanDiego. As a Program Team member, I curated a session and coached seven speakers. Here are some of my pix from backstage and what I learned from that vantage point. I’ll let you know on Twitter and Facebook when the videos get posted. One of the many incredible highlights were the musicians… all playing stringed instruments this year plus two rappers. The entire group, who had never met, kicked off the day with an improvised number that blew everyone away. As I spent the day in the green room, I got to hear lots of warming up and impromptu jamming. Here is Zach Dellinger on the viola. Note-to-self: Spend more time with musicians. Our first speaker of the day was Matt Emerzian of Every Monday Matters. Shortly before going onstage, Matt accidentally clobbered me in the kisser (he’s a very animated gesturer). I was fine, and we laughed about it all day. Note-to-self: Pay more attention to where I am in space. I coached seven incredible individuals ranging from Heberto—a philosopher and business ethicist from Tijuana—to an Auschwitz survivor, an adult-ADHD activist, a yogi, a mountain climber with cerebral palsy, a poetic marine biologist, and business guru Ken Blanchard. Note-to-self: Take more photos of the people who matter to you. 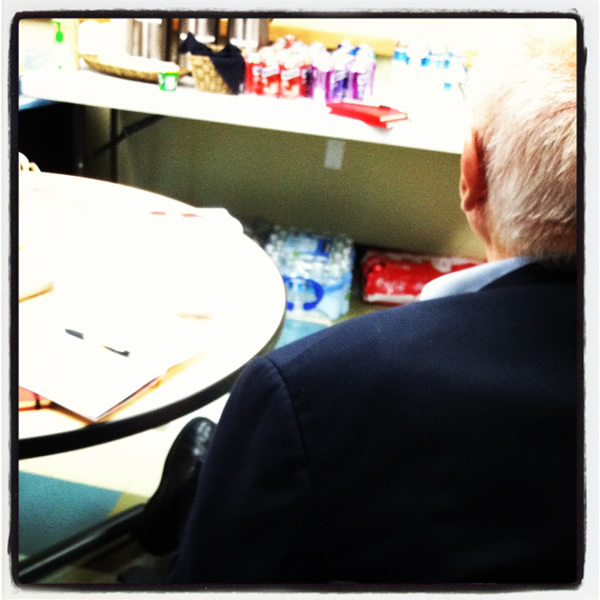 I spent the day sitting behind Ken Blanchard, who elected to spend the day in the green room. Not only did he take notes all day, modeling the lifelong learner that he is, he made connections with every speaker. My goosebump moment was when he got to tell a young African-American musician about meeting Malcolm X and Dr. King. Notes-to-self: Walk the talk. Practice spontaneity. Age really is just a number. 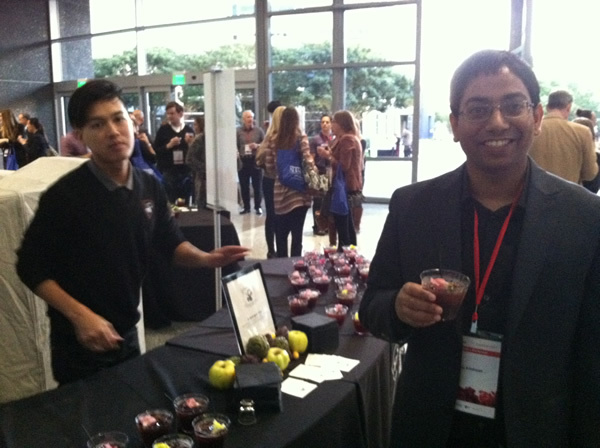 One of the coolest things about TED/TEDx conferences is the cutting-edge science and technology. 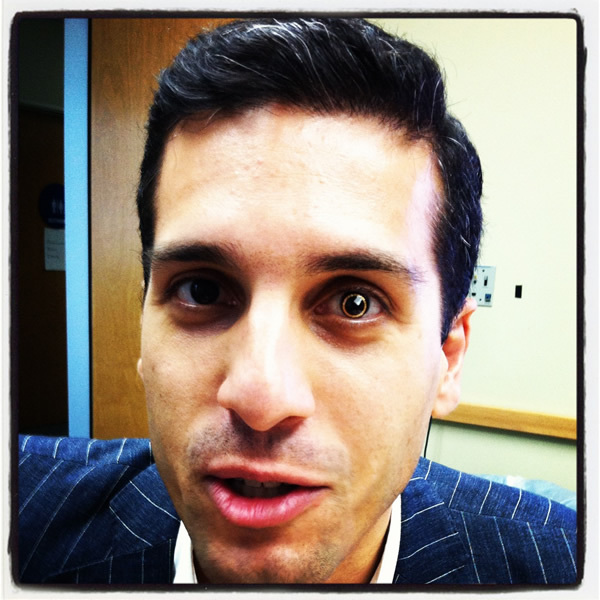 Meeting the man who co-invented this intelligent contact lens that can monitor glaucoma and possibly diabetes was astounding. Note-to-self: With all its problems, this is an amazing time to be alive. 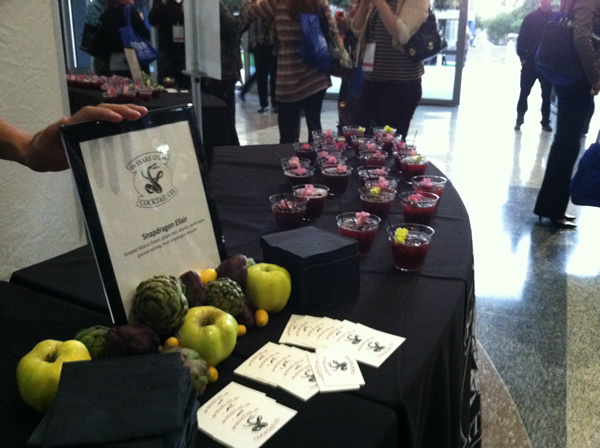 One of our team members owns this terrific cocktail company, Snake Oil Cocktail Company, and they designed a special “mocktail” for the close of the event. Note-to-self: Follow your passion, whether it leads to cocktails, contact lenses, or cancer screening. When I think of all the people I love who have been affected by cancer in the last couple of years… My friends Peg and Marjorie (survivors), my father-in-law, nephew, and Buddy Girl (who lost their battles), it just made me want to hug this guy for coming up with an EARLY screening test for the most common cancers by looking for DNA markers in blood. Note-to-self: Don’t give up hope. Yes, you read that right. 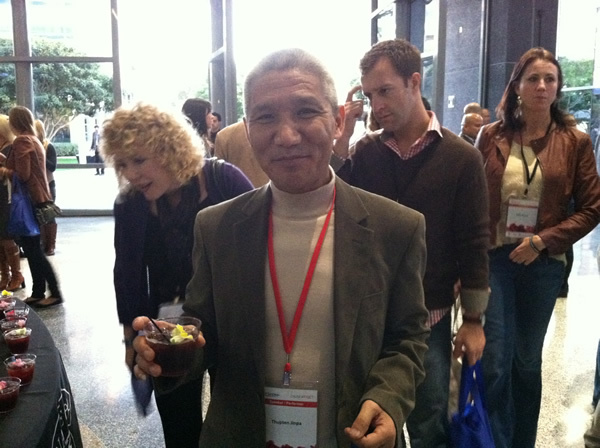 That’s the Dalai Lama’s translator having a mocktail… I sat next to him, gave him a hug, and learned you can cultivate compassion. Note-to-self: Saying yes to volunteering can bring amazing gifts into your life. Me with my “bosses” the event producers. That’s what it looks like to be completely exhausted and absolutely fulfilled simultaneously. Thanks, guys. 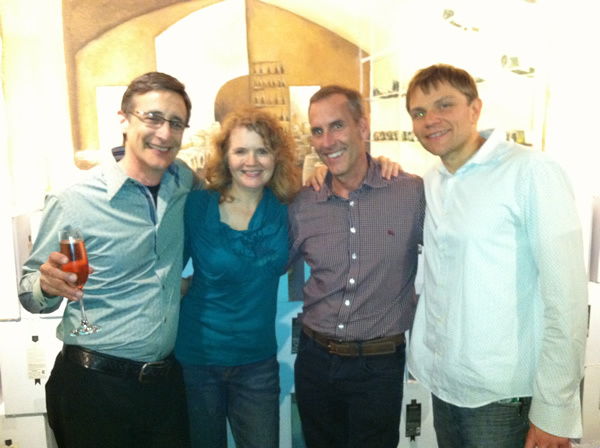 Thank you for recommending TEDx to me, as I would never have attended without your encouragement. A life-changing experience that is already affecting my daily life…and a “must-do” for next year. So glad you posted about your backstage view! What a terrific job all of you performed! 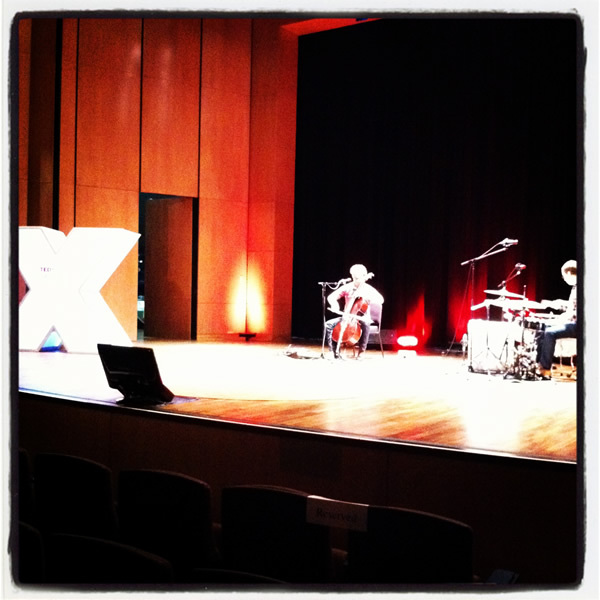 Enjoy every minute of TEDxSanDiego, and thank-you for the experience! Awesome piece, awesome author, awesome event! You’re amazing my friend. Thank you. You have an *amazing* talent for coaching speakers (Ken Blanchard pulled me aside and raved about you). Somehow you are able to figure out the essence* of what they have to say, and not let the form* get in the way of them delivering it. It’s a remarkable ability and I urge you to expand on it. It was a pleasure working with you again this year — what an event! Love, love, love this, Stephanie. It was an amazing day and your last paragraph says it all.